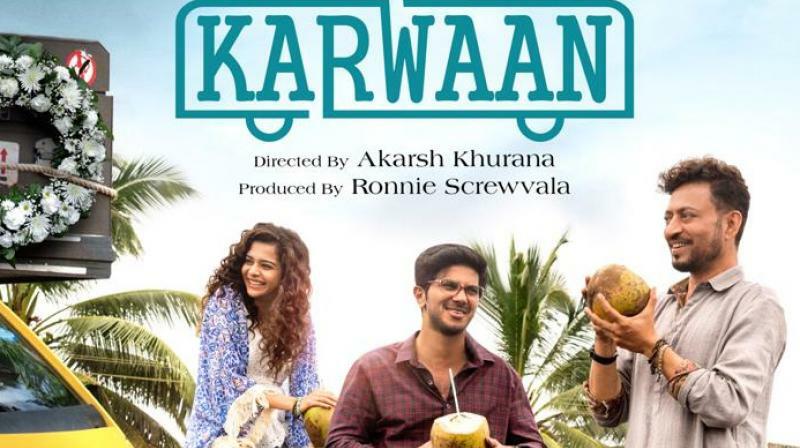 The first poster of the film Karwaan is out now. 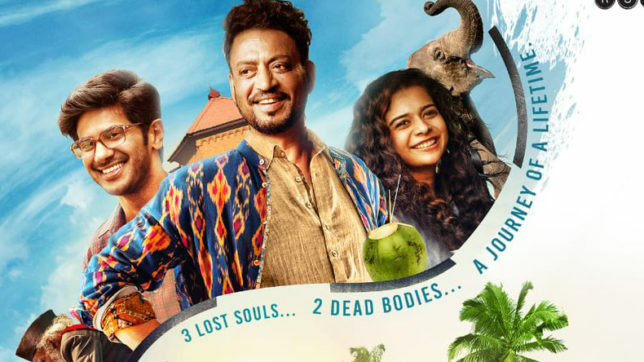 The movie is starring Irrfan Khan along with Dulquer Salmaan and Mithali Palkar. Dulquer Salman was previously starring Malayalam. It is his first time when he is screening with Bollywood actor Irrfan Khan. 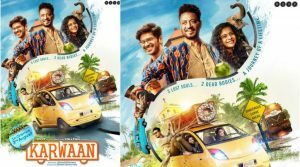 Film critic Taran Adarsh shared the poster of the movie Karwaan and tweeted, “Irrfan, Dulquer Salmaan and Mithali Palkar”. The poster of the movie shows a small yellow car. Dulquer Salmaan is driving the car, and mithali is sitting on the front seat of the car. While another actor Irrfan Khan is hanging out of the car window and tries to hold the coffin with the help of the rope. The posters depict the tagline of the movie Karwaan, three lost souls and a dead body in the coffin. It sounds quirky but exciting at the same time. The film was shot in the beautiful locations of Kerala. The movie is directed by Akash Khurana and expected to be released on 3 August. The film is romantic comedy entertainer which is having a lot of fun. The movie clashes with Fanne Khan which is also going to hit the screens on 3 August. Fanne khan is directed by Atul Manjrekar and starring by Anil Kapoor, Aishwarya Rai Bachchan and Rajkummar Rao. In recent past, Irrfan Khan announced that he is suffering from the Neuro Endocrine Tumour. Nowadays the actor is in the UK to get the treatment for his disorder. His fans are praying for his excellent health. In IIFA 2018 which was held at Bangkok, Irfan Khan won the best actor award for his role of the father in the movie Hindi medium. Where he was nominated against Ranbir Kapoor, Adil Hussain and Rajkummar Rao. As he was suffering from the disorder due to which the Bollywood actress Shraddha Kapoor accepts his award. King of the Bollywood Shahrukh Khan made an offer to Irrfan Khan and his wife Sutapa before they are leaving for the treatment to London. SRK handed over the keys of his apartment in London. SRK also insist Irrfan Khan to accept the key.